FOSTER UPDATE: Carmen is a sweet girl that loves attention. She is very affectionate to children and extremely easy to walk on the leash. Grooming is no problem, but some resistance is evident when it comes to cleaning the ears. So far, Carmen knows the commands: ‘Come’ and ‘No.’ She is still learning to respond to her name. While there have been no issues with Carmen when she tabled at Bookman’s, she can be a little skittish initially when meeting new people. Carmen is house trained using a doggie door, has no fear of cars, vacuums, or other loud noises, and is not crated as she is not destructive in the home. However, she is a food hog and will rummage through the trash, food drawers or containers if they are left unsecured. 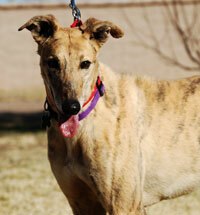 Carmen would do best in a home with mature people/individual who will be around most of the time.